My favorite Beatles song is on the Let It Be album, but it’s not the title track, or Long and Winding Road, even though I love both of those. My favorite song is Two of Us. The first time I heard it I was in desperate puppy love with one of my distant cousins, a young man I saw only in the summers when he came “up north” to visit our family. The song spoke to me as a 13-year old getting her first glimpse of what it felt like to be that someone special in a relationship of two. The song has continued to speak to me over the decades of falling in (real) love, getting married, raising a family, and making a life together. It reminds me of being carefree and young (“two of us riding nowhere, spending someone’s hard earned pay”) and also of the shared experiences of long-term love (“you and I have memories longer than the road that stretches far ahead”). 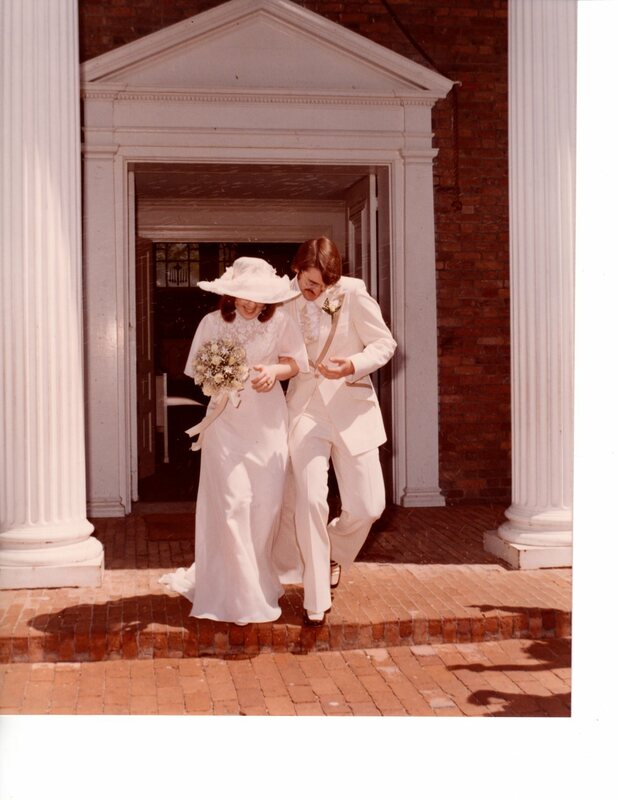 Today, Jim and I celebrate 40 years of marriage, and indeed our memories feel much longer than the road that stretches ahead. As I looked through our wedding album recently, I was reminded of how much we looked forward to being on our own that day, moving out of our respective parents’ homes, getting out from under their overprotective care. We desperately wanted it to be just the Two Of Us. Although we lived in our own home, it was only just down the street from my parents. Jim’s parent’s divided their time between homes in Florida, Northern Michigan, and an apartment in Plymouth. We still spent a lot of time with all of our parents in those early days and in the ensuing four decades - every holiday, every weekend, and lots of days in between. Both of us had a very deep-seated emotional commitment to our parents, one that developed for different reasons in each of our hearts, but one we never shirked even when it was difficult, and even when we had to deny ourselves to honor it. Then, one by one, our parents began to disappear out of the tapestry of our life. First Jim’s Dad in 1993, his mother in 2008, my dad in 2013. And finally, my mother in 2016. Our only son and his family live a thousand miles away, and he takes care of himself nicely without much assistance from us. So this anniversary, it really is just the Two Of Us. I feel a little bit like I did in this picture of our wedding day - poised on the steps of the chapel and running headlong into the future. On that day, the idea of what we’d be doing 40 years in the future was mind-boggling. Right now, planning further ahead than what to have for dinner is all the challenge I need. But on the days when I’m thinking clearly, I admit to twinges of excitement about what the future might hold for the two of us. “You and me Sunday driving, not arriving, on our way back home,” sings Paul in that song from the 1970’s. I’m kind of hoping the next decades of our marriage will contain some of the breezy spirit of the Sunday drives we like to take in our 98 Trans Am - happy ambles with the wind blowing in our hair, the sunshine in our face, and a nice meal somewhere along the way before we return home to our shared life. Because no matter what, as long as we’re together, the chorus of that song will remain true no matter where the road ahead takes us.